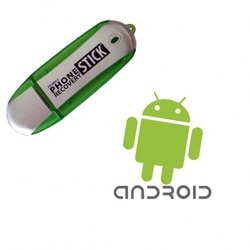 The Android Recovery Stick is a versatile thumb-drive USB device that will help you recover deleted data as well as other data from your Google Android phone. Simply connect the cell phone and stick to any PC, then run the built-in software on the Android Recovery Stick with the easy-to-use interface to recover the data you are looking for with the click of a button. The Phone Detection Stick runs on Windows XP, Vista, 2000, and 7. This device only officially supports up to Android 2.2.x. You must have the PIN for locked phones before performing a recovery. Due to the nature of electronic data storage, it may not be possible to recover all data.